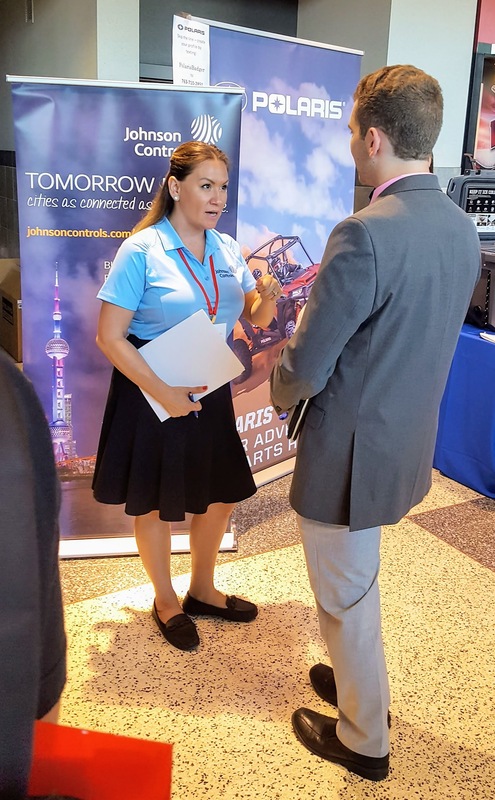 Shanon Vuckovic, Senior Recruiter of Early Career Programs – Talent Acquisition at Johnson Controls talks with a candidate at the Fall Career and Internship Fair held at UW last week. Shanon actively uses Handshake to review resumes and set up opportunities for interviews on campus. The academic year is in full swing and so is Handshake, UW–Madison’s new tool to help students find jobs, internships, and campus career events. Handshake officially replaced BuckyNet and myECS as the primary campus tool for student recruitment and event management over the summer, and since then thousands of students and employers have made the transition to the new system. “We chose Handshake because it has a great track record for increasing student engagement, connections to employers, and the quantity of relevant job and internship opportunities,” shares Wren Singer, associate vice provost and director of undergraduate advising, and one of the executive sponsors of Handshake. In addition to its solid reputation for increasing student and employer connections, Handshake was also selected based on its modern interface that mirrors other social media platforms like LinkedIn or Facebook. Handshake’s “smart” technology is one of the most appealing features of the tool for Nate Doolin, Recruiting & Events Coordinator for SuccessWorks at the College of Letters & Science. The more a student uses Handshake, the better the system gets to know them. Students will get personalized recommendations for jobs, internships, or upcoming events based on what they’re looking for,” Doolin says. Handshake also recommends opportunities to students based on other preferences they can set, including major, industries, interests, hobbies, location, and type of experience they’re seeking. Ferguson is optimistic that the greater visibility of career services will support efforts to engage first and second year students in the career exploration and development process. In addition to campus career services initiatives like Handshake, the launch of the Office of Business Engagement this July – an office that was created after re-envisioning the mission and scope of the Office of Corporate Relations – will provide additional focus on strengthening the engagement between industry partners and students. The Office of Business Engagement is led by Amy Achter, a former manager for the Oscar Mayer division of Kraft Foods, and will serve as a central hub for companies to connect with UW–Madison. More information about Handshake for students, employers, and faculty and staff is available on www.careers.wisc.edu/handshake. To learn more or connect with the Office of Business Engagement, visit https://obe.wisc.edu.